LEGO City Jungle Explorers Jungle Cargo Helicopter - Save 40%! Home Toys & Games Building Toys LEGO City Jungle Explorers Jungle Cargo Helicopter – Save 40%! LEGO City Jungle Explorers Jungle Cargo Helicopter – Save 40%! Your LEGO builder will love this NEW LEGO collection called Jungle Explorers we found on Amazon! Hurry and get the LEGO City Jungle Explorers Jungle Cargo Helicopter 60158 Building Kit (201 Piece) today for only $11.99 (regularly $19.99) from Amazon! This is the best price ever on Amazon. NO limit, so HURRY! 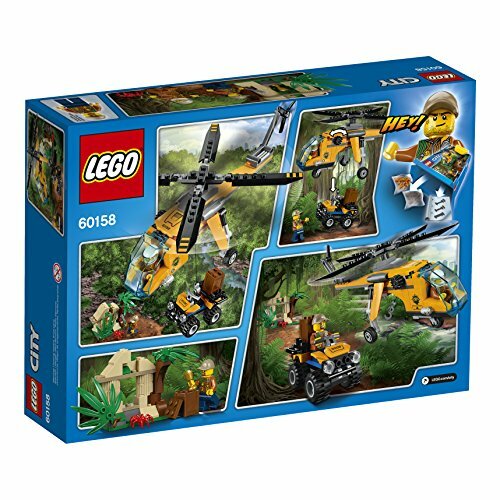 Head deep into the LEGO City jungle with the Jungle Explorer Helicopter, featuring an opening minifigure cockpit, spinning rotors and working winch, an ATV with space for a minifigure, a treasure box and a temple with moving leaf revealing a gold-colored chalice. Includes 2 minifigures, plus a spider figure. Buy the LEGO City Jungle Explorers Jungle Cargo Helicopter 60158 Building Kit (201 Piece) from Amazon. Previous articleCinderella Movie [DVD + Digital Copy + Blu-ray] – BEST Price! Next article55-Inch 4K Ultra HD Roku Smart LED TV Deal!